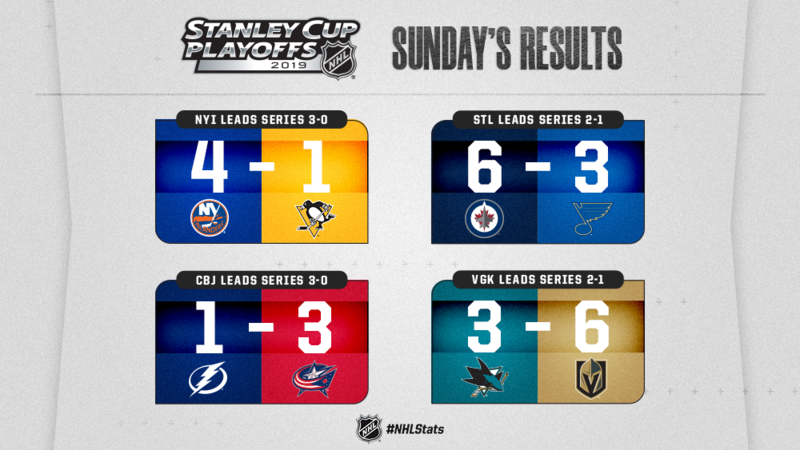 The Blue Jackets and Islanders each opened up commanding 3-0 leads in their respective series, while the Jets and Golden Knights each benefited from six-goal outings to collect crucial Game 3 victories. 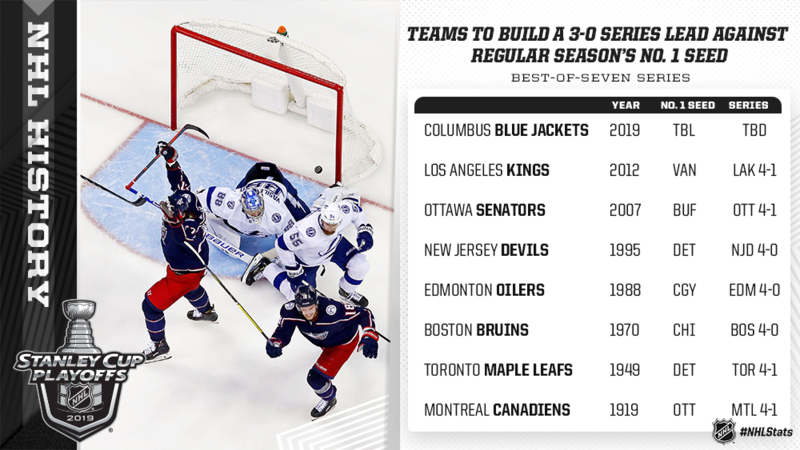 * The Blue Jackets and Islanders each took 3-0 series leads, with Columbus pushing Presidents’ Trophy-winning Tampa Bay to the brink of elimination and New York doing the same with Pittsburgh. * With opening-minute goals in every period and five points apiece from Mark Stone and Paul Stastny, the Golden Knights rode early momentum to accomplish a rare feat and pull ahead in their series. 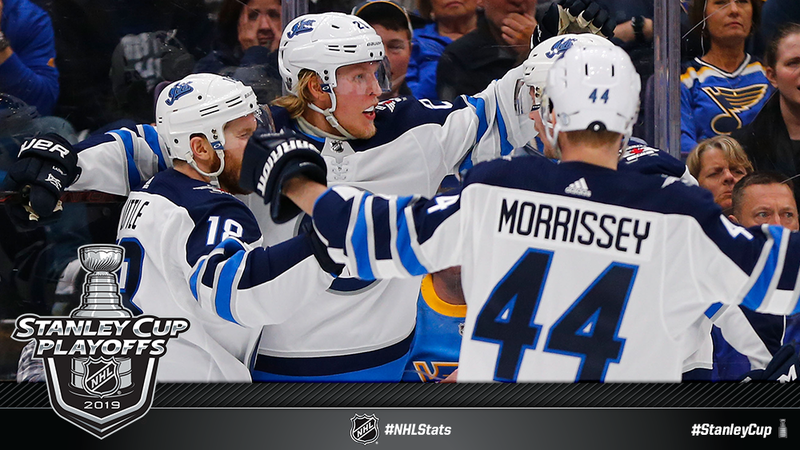 * Patrik Laine scored for a third straight game to help the Jets to their first win of the 2019 Stanley Cup Playoffs. 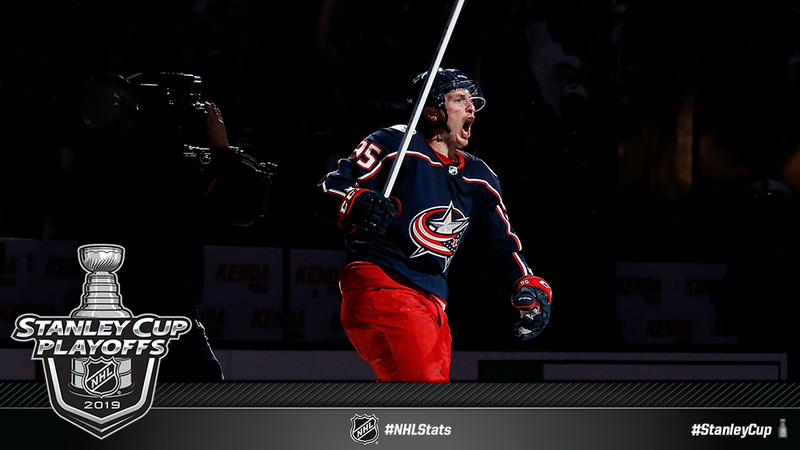 * With three wins in a series for the first time, the Blue Jackets now sit one victory shy of becoming the fourth team in NHL history - and second in as many seasons - to complete a four-game sweep to post their first-ever series victory. The Golden Knights (2018 R1 vs. LAK) and Penguins (1970 QF vs. OAK) each swept best-of-seven series, while the Flames (1981 PRLM vs. CHI) did so in a best-of-five. 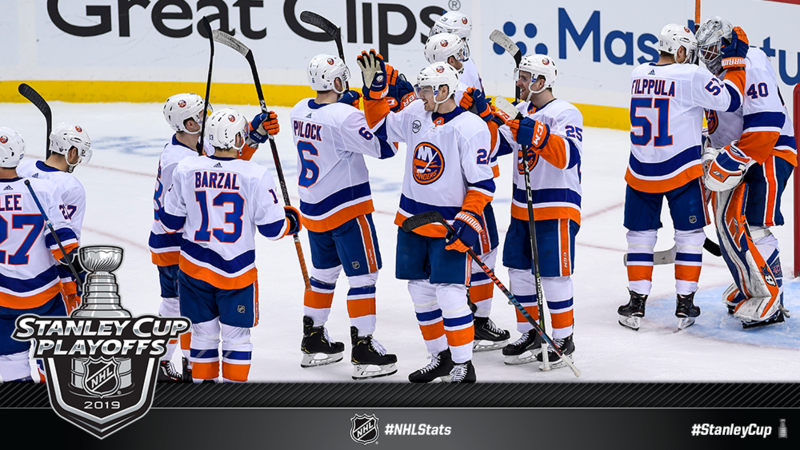 * Overall, this marks the 11th time in League history that the team with the best record in the NHL during the regular season has lost the opening three games of a series (at any point in the playoffs) - and eighth under a best-of-seven format. Five of the 10 previous instances have happened in the expansion era (since 1967-68). The Golden Knights scored in the opening minute of each period - with Mark Stone (3-2—5) and Paul Stastny (2-3—5) accounting for each of those goals - en route to a Game 3 victory and a 2-1 series lead. Vegas is the first franchise in NHL history to hold a lead in each of its first five all-time playoff series. 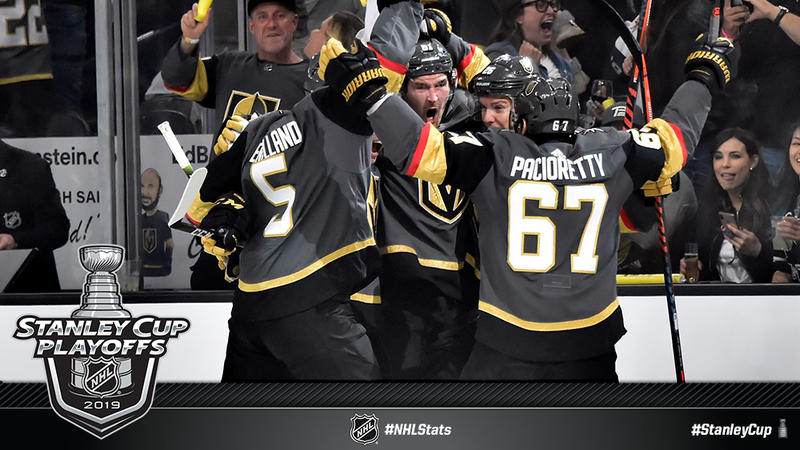 * Both skating in their first season with the club, Stone netted his first career hat trick and Stastny registered a career-high five points - marking the first playoff hat trick and first five-point games ever by a Vegas player. 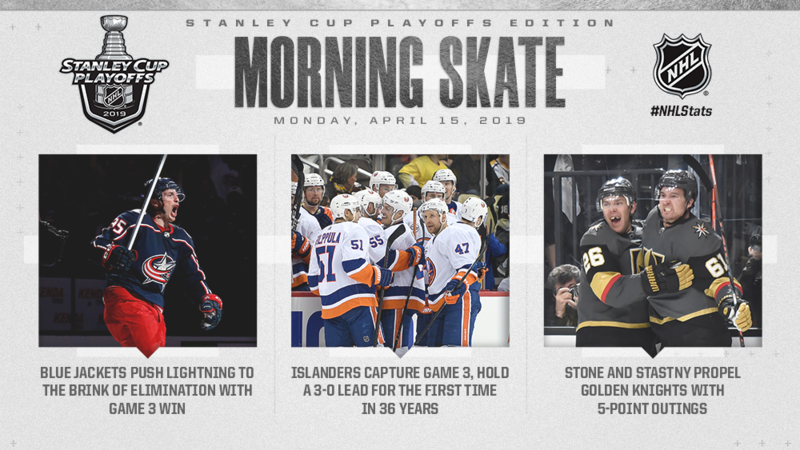 * Acquired at the 2019 NHL Trade Deadline, Stone has compiled 6-2—8 through three playoff games - surpassing his goal total over 18 contests with Vegas during the regular season (5-6—11). Additionally, his eight playoff points already equal his 19-game total compiled with Ottawa during its run to Game 7 of the Eastern Conference Final in 2017 (5-3—8 in 19 GP). 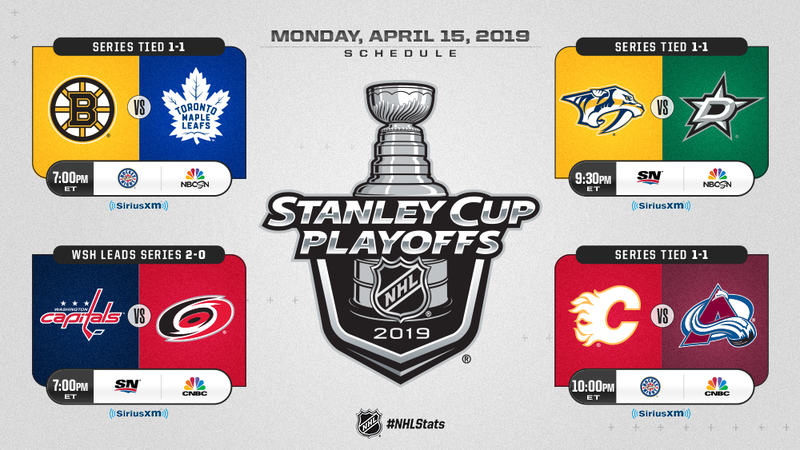 Playoff hockey returns to North Carolina for the first time in a decade as the Hurricanes look to cut their series deficit, while the Maple Leafs, Starsand Avalanche return home after earning splits in the opening two games on the road. * Three of these series required overtime on Saturday, with only the Bruins-Maple Leafs matchup decided in regulation. Overall, there have been four overtime games in the First Round thus far. In 2017, the First Round featured 18 overtime games - the highest such total in the opening round of the playoffs in NHL history.